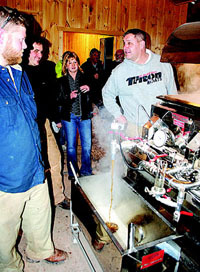 GRAHAMSVILLE – With nearly 80 people on hand, the Catskill Mountain Sugar Shack unveiled its new, state-of-theart evaporator and sugar house addition on Sunday afternoon. Located at 227 Glade Hill Road, high above the Rondout Reservoir outside Grahamsville, the Catskill Mountain Sugar Shack is fast becoming one of the major maple syrup producers in all of New York State. “We’ve added 12,000 taps this year,” owner John Garigliano said. 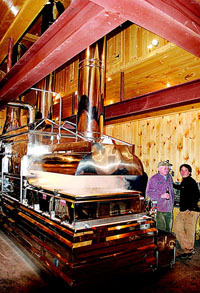 With its new oil-fired evaporator in place, Catskill Mountain will now be able to make nearly two gallons of maple syrup per minute as it processes tens of thousands of sap per season. In addition to adding the new evaporator, Catskill Mountain also added a larger reverse osmosis machine, thirty thousand more gallons of storage and more than doubled its building size. A handful of local contractors helped with the building project. Carl Lapierre, director of marketing for Lapierre Equipment, one of the leading maple syrup equipment suppliers in Canada, was on hand Sunday to insure that everything went smoothly with the installation of all the new equipment. “This operation is very impressive,” Lapierre said. “It is energy efficient, technologically advanced… very near perfection.” Lapierre said the new reverse osmosis machine – which takes water out of the sap before it is boiled – will save tremendously on fuel costs. 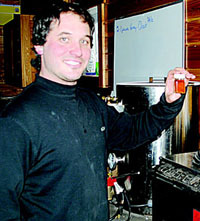 John Garigliano holds the first ‘sample jar’ of maple syrup produced by the new evaporator. Sample jars are sold along with the 55-gallon barrels so buyers know exactly what they have – light or dark syrup – inside. Carl Lapierre brought several members of his staff from St-Ludger, Quebec on Sunday to insure the proper operation of the new evaporator which the Catskill Mountain Sugar House installed. Lapierre is standing next to a ‘Lapierre’ 6,000 gallon storage tank which holds sap before it is sent to the reverse osmosis machine. Neighbor Keil Hornbeck of the Eureka Sugar Shack talks with John Garigliano on Sunday, the first day of operation for the new evaporator. Keil and his brother Adam make maple syrup in the adjoining farm. 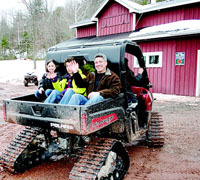 Sullivan County Legislator Ira Steingart enjoys a ride in the back of an ATV along with his children Ally and Zach on Sunday afternoon at the Catskill Mountain Sugar House. The Steingarts were on their way up the mountain to see the miles of tubing which carries the sap to the various sap houses throughout the property. After the water is “boiled off” the sap, the maple syrup runs into the stainless tank. The syrup is then purified before being stored in 55 gallon drums. Here a group watches as the new evaporator makes some syrup.